Tom Brady has had a busy summer. He's sold sporting goods, new cars and even candy. Now, he's really gone to the dogs. 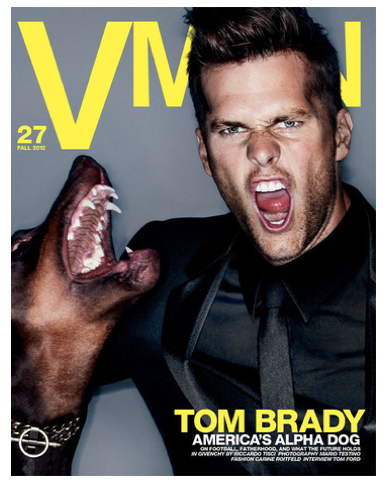 As if we didn't already know, Brady is now officially "America's Alpha Dog" - at least according to the upcoming issue of VMAN Magazine due out next week. Does this make Eli Manning "America's Dog Catcher"? "A Glam Slam" writer Heather Zeller reports that Brady was interviewed by fashion designer, Tom Ford (whom Brady is wearing throughout the photo spread) and discussed - what else - his supermodel wife - in addition to fatherhood and life after football - which no one in New England wants him to be thinking about. Wonder if he got this collar from Gisele? You can collar your copy of the magazine here.